This is a gorgeous ladies silk front blouse from MANGO. Pit to pit: 22". The front is a lovely cream colour with vibrant green palms and beige zigzags printed beneath. Pop over style. Jersey block colour back. Blue & Green Floral Tie Waist Top - Monsoon - Size 10. This item is used but in immaculate condition. Please message me for any information about this item! Happy shopping! Yumi Cute Fish Blouse Size 14, Beautiful Design, Brand New Without Tags. What we have here is a beautiful brand new without tags cute fish blouse from Yumi in a size 14, it has only been tried on. Postage will be charged. Please check out my other items. I am more than happy to answer any questions asked. I am more than happy to combine postage just ask. New items added daily. 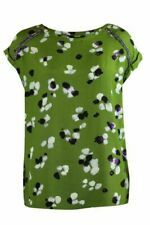 Linea Ladies Silk Top Size 12 Colour Green Floral Pattern.side zip fastening ties at the front ,Condition is Used. Dispatched with Royal Mail 2nd class. Izabel top size 12 geometric pattern summer. Condition is Used. Worn a handful of times. Dispatched with Royal Mail 1st Class. Olive Green 100% Silk Women’s size 10 Cap Sleeve Top. Very good condition. Worn once. Flattering V front and back. Dispatched with Royal Mail 2nd. Class. ladies blouses size 16 - Next- Excellent Condition With Bird Print. Condition is Used. Dispatched with Royal Mail 2nd Class. New listingLadies Blouse Made by Next. Size 18 Good used condition..
Ladies Blouse size 18 .Bought from Next. In good used condition.some creasing due to storage reason for sale lost weight.see photos for colours and condition. Loose-fitting, longline tunic design with gently curved bottom hem. Gorgeous cargo-style linen tunic blouse from Uniqlo. Khaki green 55% linen, 45% cotton fabric with a lightly woven, textured finish. Gorg Jade Green Wallis Floral Top size 12. Holidays. VIOLA BORGHI - BEAUTIFUL SILK BLEND TOP SIZE L (14-16). Stunning for summer, very vibrant green. Condition is New with tags. Dispatched with Royal Mail 1st Class. ZARA BASIC. IMMACULATE CONDITION. Sage green. Skirt in pics match well with the blouse,skirt is also listed. Cap Sleeves. Back zip fastening. After stopping to read all of the above you are probably ready to go put the kettle on for a cuppa. 120% LINO Linen Wrap Top. Slip on wraparound style with self ties. Ruffle detail. Short cap sleeves. Next Lacey Top 20. Dispatched with Royal Mail 2nd Class. LAGENLOOK OVERSIZED LIME GREEN LINEN TUNIC TOP. Condition is Used. Dispatched with eBay delivery – Shutl 2-3 days. Lovely Mistral floral Top. Green with a floral print. Size 10. Condition is Used. Dispatched with Royal Mail 2nd Class. Gorgeous mix of peach, green and blue floral pattern. Pit to pit 20” Shoulder to hem 26” Hem width 23”. 100% Polyester Machine washable. Length (shoulder to hem) approx 24". FAT FACE WRAP AND TIE BLOUSE. OLIVE GREEN. CHEST 20.5". LENGTH 24". 100% Cotton. Lovely quality with very fine stitching. Gathering details at front shoulders, on the short sleeves and at waist - creating shape. Crisp thick cotton fabric. Cap sleeves. Top shoulder to hem: 21". BNWT RRP £39.50. MARKS AND SPENCER LADIES STUNNING BLOUSE. Stunning blouse feels really silky, long sleeves with button fastening angled sleeves. 100% Linen, machine washable and can be tumble dried.